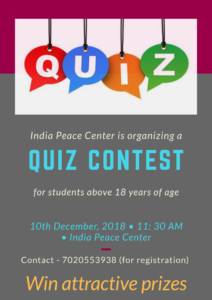 Arts for Peace is a series of competitions in which students and youth from different schools and colleges will participate and bring out their ideas of peace in the present context in run up to the celebrations of International Peace Day. Those arts will be displayed in the premises of India Peace Centre on 21st and 22nd of September 2018 for public. 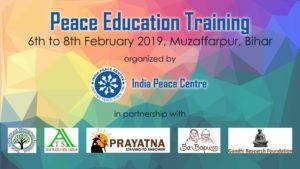 Warm greetings from India Peace Centre! The United Nations are an association of 193 states. It has the duty to secure the world peace, the human rights and to support the collaboration between states. 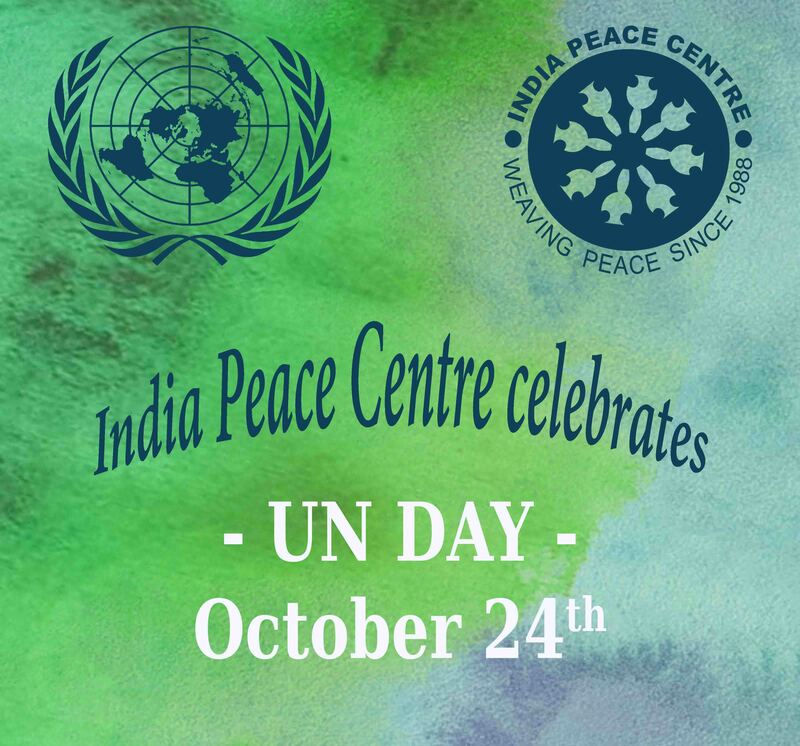 In honor of this organization, the whole world is celebrating the UN-Day, at 24th of October. For this special event, the India Peace Centre is planning a round table discussion on the topic: What can we do to fulfill the Sustainable Development Goals? 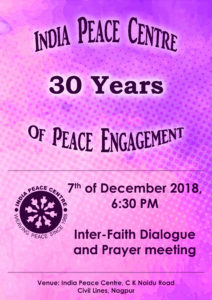 Several prominent members of the India Peace Centre, such as Dr. Rayalu, Dr. Rawal, Dr. Raffique, Dr. Khwaja and Ms. Piali will present the possibilities of action regarding the Human Development Goals and the main objectives of the India Peace Centre. 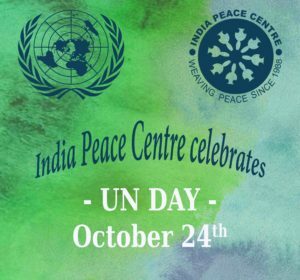 The program will premise at 24th of October at 5 PM in the India Peace Centre. 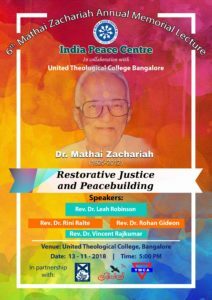 We would like to invite you and your colleagues to this colloquium and expect you to share your thoughts and experiences with us so that we can make concerted efforts to make peace more visible in our communities. 6th Annual Mathai Zachariah Memorial Lecture to be delivered by Rev. Dr. Leah Robinson, Professor of Pastoral Theology, School of Divinity, Edinburgh University, Scotland. 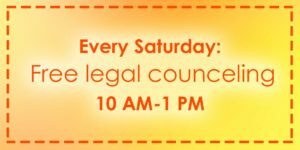 We are looking forward to seeing old and new friends to celebrate Constitution Day with us. 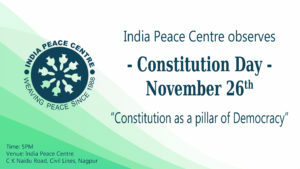 We are having a program on the topic “Constitution as a pillar of Democracy” at 5 PM held on the IPC Campus, Nagpur. India Peace Centre is happy to announce its colaboration with Global Shapers Nagpur to host a special viewing event of the Indian segment of the Climate Reality broadcast #24HoursofReality.Please join us on 4th of December from 3 PM onwards at IPC. Hosted by former US Vice President Al Gore and The Climate Reality Project, the 24 Hours of Reality broadcast will travel around the world, each hour, highlighting the inspiring stories of climate activism from 24 countries from six regions. Alongside these stories, Vice President Gore will share the latest from the frontlines of climate impacts and action in each region including India, while leaders from business, policy, culture, and science will join us for thought-provoking studio conversations.